These are some our favourite images from our recent newborn photography sessions. We take great care and work very hard to ensure you receive the very best images possible. Our sessions include an experienced photographer (Neil) and an experienced stylist (Debra) this gives us more opportunity to create some gorgeous set ups. All our newborn sessions are done in the comfort of your home making it so much easier for you and your family. We bring everything to you and everything you need is at hand. 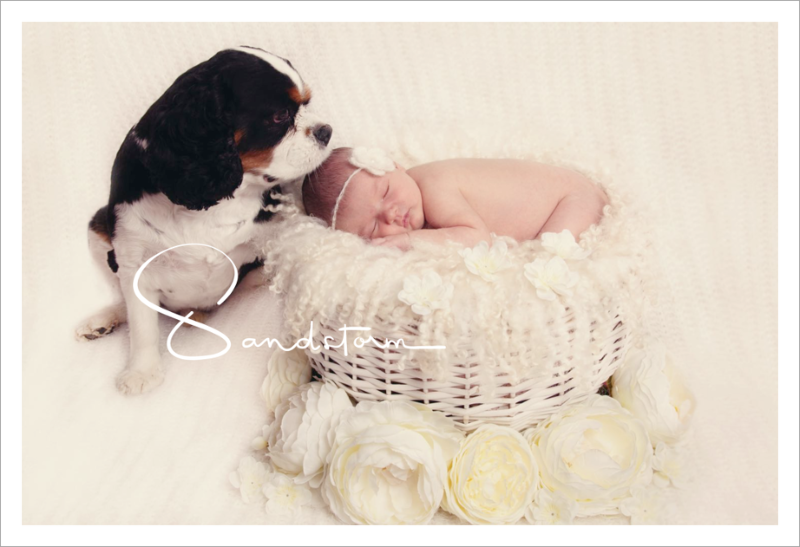 We love to include all the family in our newborn photography session, including pets! Albert the dog was so loving and protecting over baby Olive. It’s lovely to capture! Parents are also included in our newborn sessions. Baby Amber is just 6 days new and an absolute beauty! We had the pleasure of photographing her at her home in Nottingham. All our Newborn Photography sessions are in the comfort of your own home, you will find it much easier than having to worry about taking your baby and family to a studio. Everything you need is at hand to you at your home so it is overall less stressful. We love to include Mum in our photographs, they make beautiful images that you will treasure. How lovely to look back and show them when they are older how proud you are of them. Amber’s mum chose our gorgeous prop ‘A bed of fresh Roses'” for Amber- Rose to match her beautiful name, it suited her perfectly. You can choose from a wide selection of props that we have to perfectly compliment your baby and be personal to you. We visited Darcie at her home in Newark for her first newborn photography shoot. She is just 6 days new and what a little sweetheart! We had the pleasure of photographing this gorgeous baby boy Coen and his family at their home . Coen was just 10 days new and his big sister Enya was so loving with him. An extra special touch from Coen’s mummy “from God” label. We love to include your personal touches and special items in our session. This makes it unique to you. Here is gorgeous Niamh at 4 months! We have a beautiful range of dreamcatchers for your newborn to be photographed in and exclusive designs available for all ages of baby.